For this week’s poll, we want to know what your thoughts are about tablets. Are tablets useful to have or just another luxury product? Tablets are steadily growing in popularity; it seems like almost everyone has one – even children. Some people use their tablet daily as their main mobile device, while others use theirs casually. Personally, I have both an iPad and a laptop, and I use both during various times throughout the day. I find my tablet to be extremely useful for many different tasks such as: checking my email; keeping up with my favorite social networks like Twitter and Facebook; taking and sharing pictures; watching videos, movies and TV shows; doing quick research in the browser; playing games to pass the time or to relieve stress; making phone calls via Google Voice; and much more. I really cannot live without my tablet because I find it extremely useful for so many things. It’s a part of my everyday life. How about you? Now it’s your turn to tell us how you feel. Are tablets useful or do you think they’re just another luxury product? Do you have an opinion regarding the usefulness of tablets? Be sure to tell us in the comments! We’d also love to hear if you have a tablet and the different uses you have found for it. 28% of the voters allow their kids to access the Internet before they hit 8 years old. 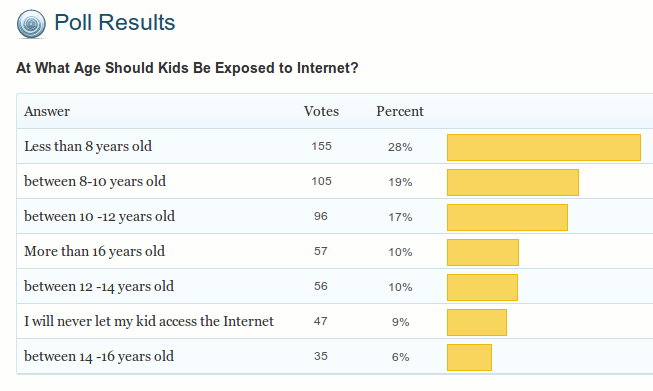 On the other end, 9% of the voters do not want to grant their kids access to the Internet at all. The rest of the votes spread evenly across the various age range. They are neither. They are a niche product. Tablets are more convenient than laptops and desktops but are less capable. Whatever can be done on a tablet, can be done on a laptop or a desktop. However, the reverse is not true. To me, tablets are the next step in the evolution of netbooks. The Web Browsers Comparison Guide: Which One is the Best Browser For You?